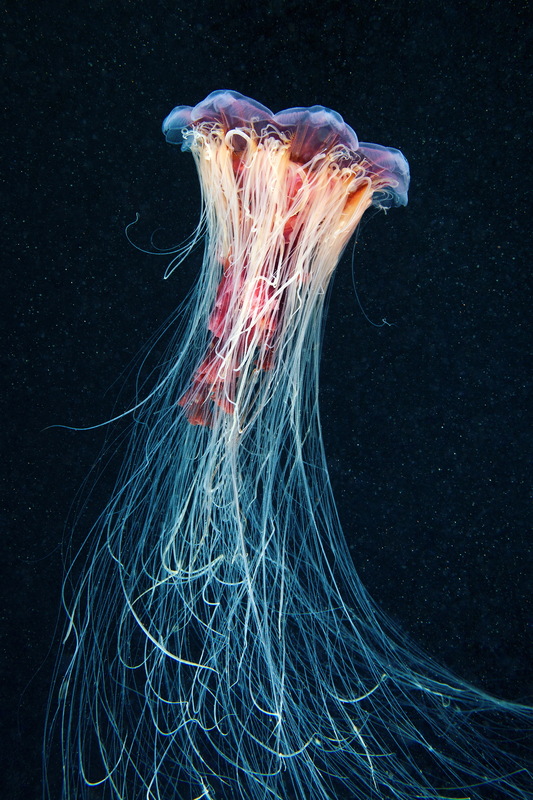 Scyphomedusae are the most common representatives of coelenterates. 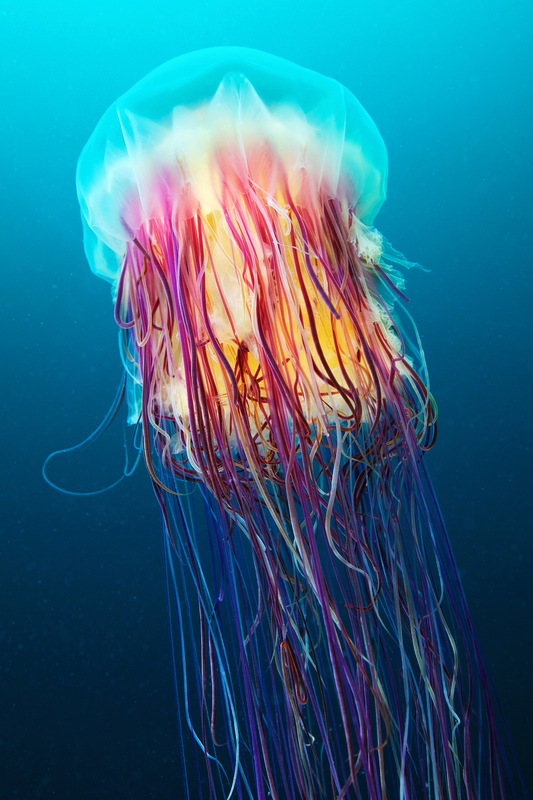 Anyone who has visited the coast is familiar with these jellyfish. 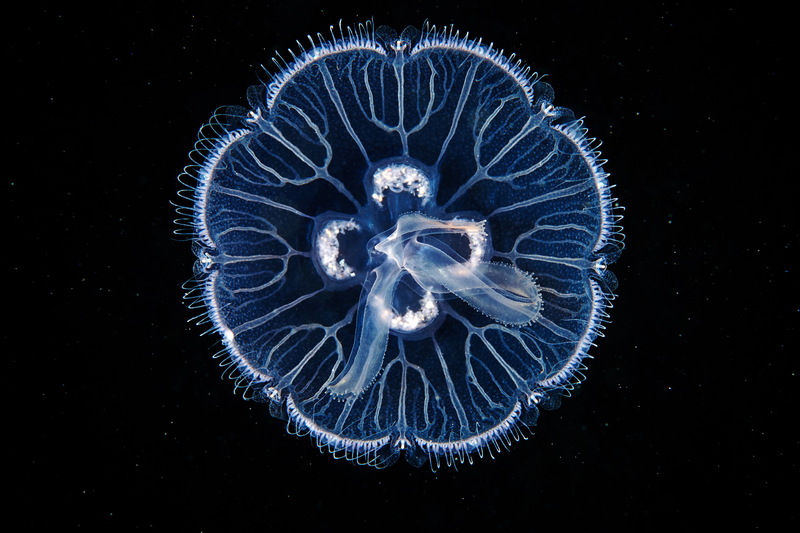 You probably won’t be able to see the tiny and ephemeral hydrozoans, but there is no need to peer into the water to notice scyphomedusae, since they are, on average, rather large and sometimes grow into real giants. 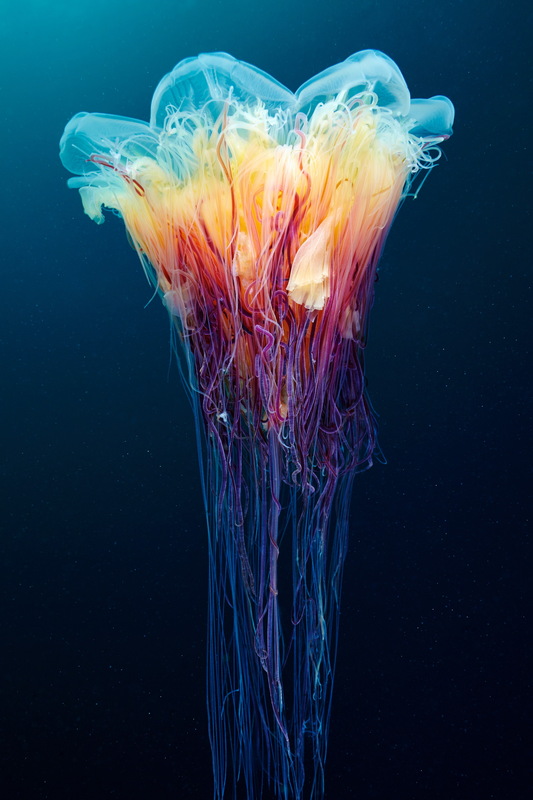 Scyphomedusae span in size from tiny 2-millimetre ephyrae to giants whose tentacles are 36.5 meters long – the height of a 12-story building! 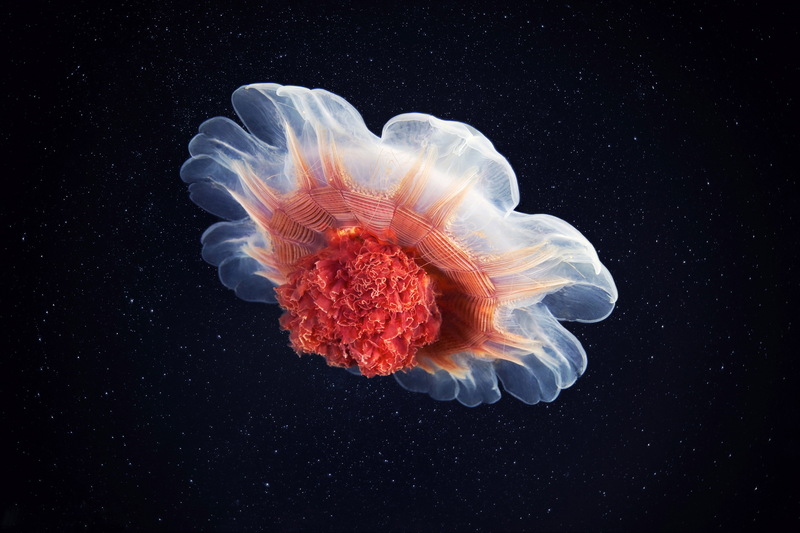 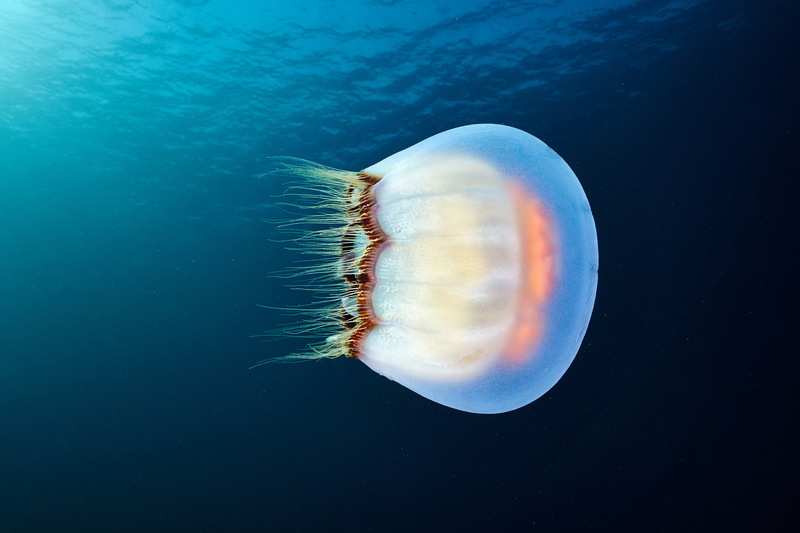 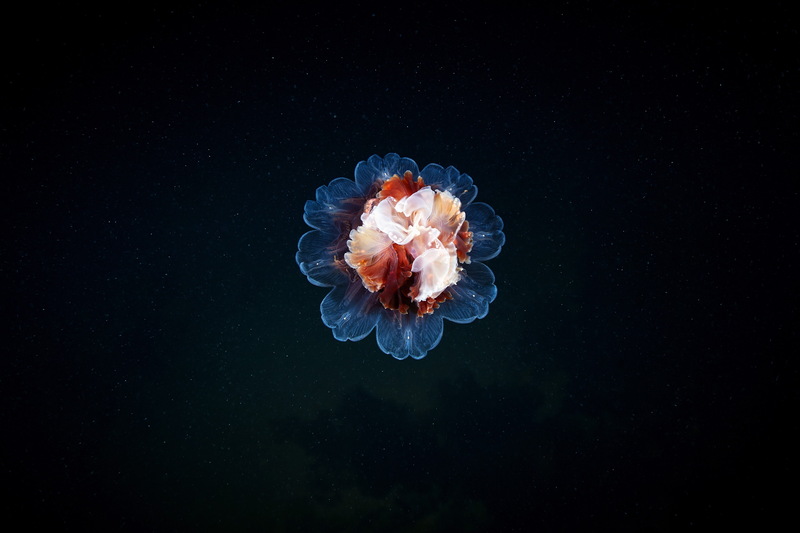 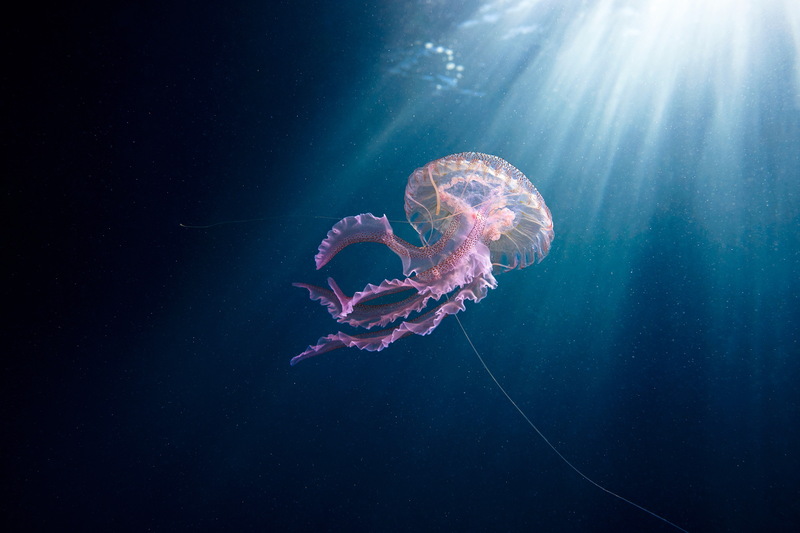 Even though they can be huge, the jellyfish have a rather simple structure: they don’t have a head, gills or developed nervous and digestive systems. 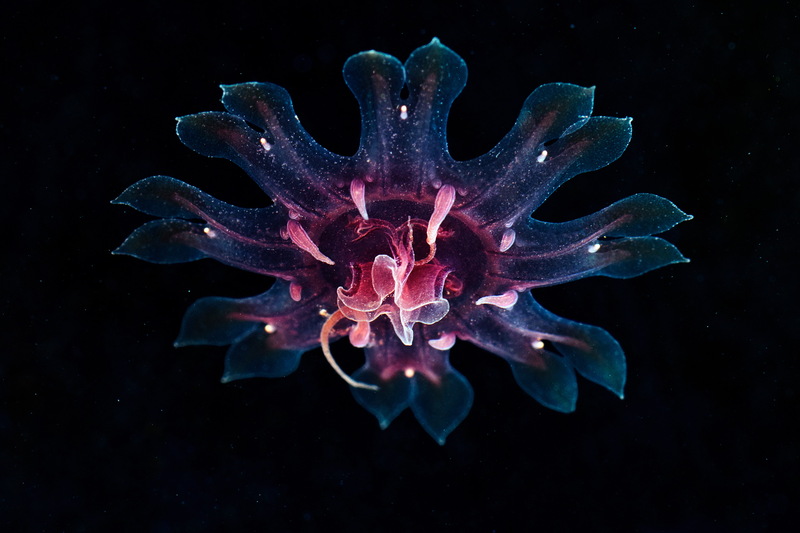 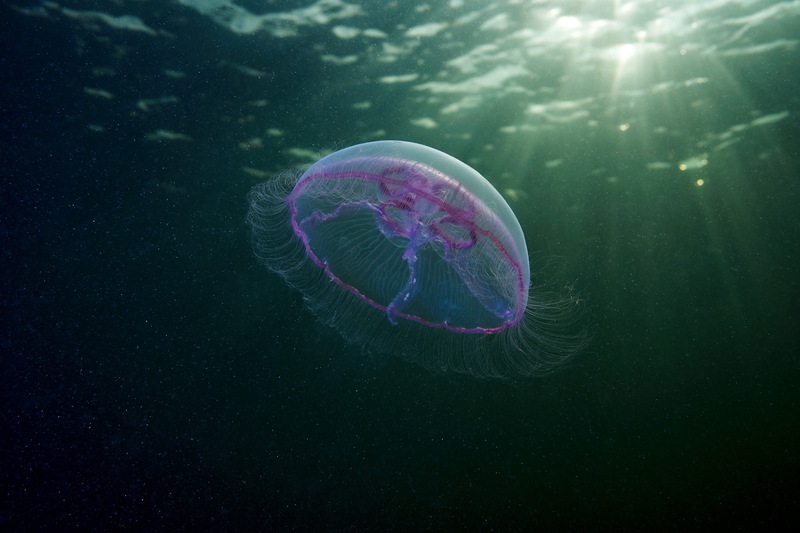 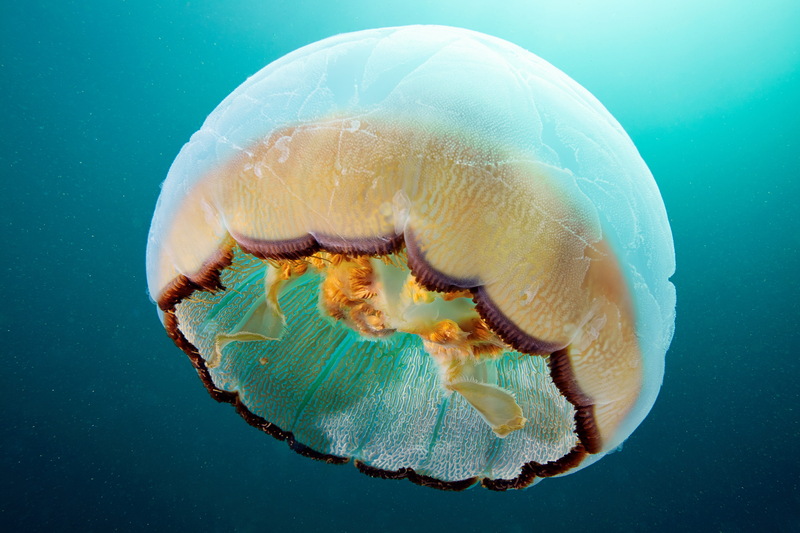 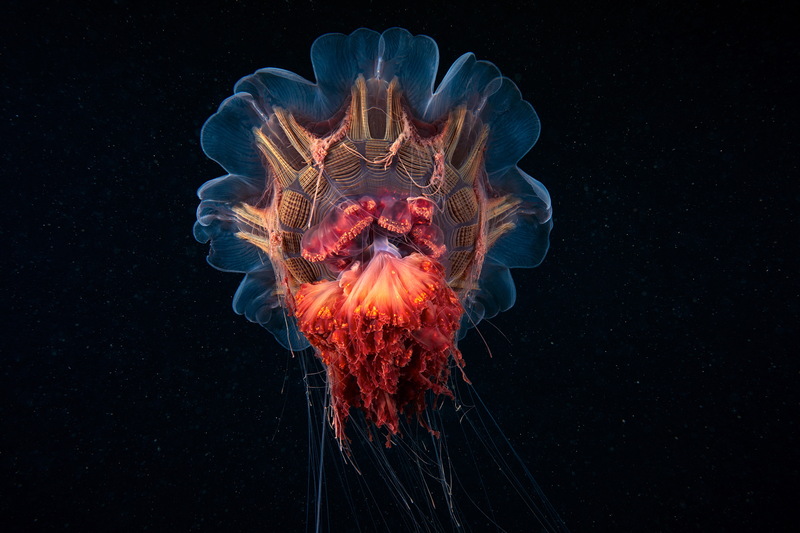 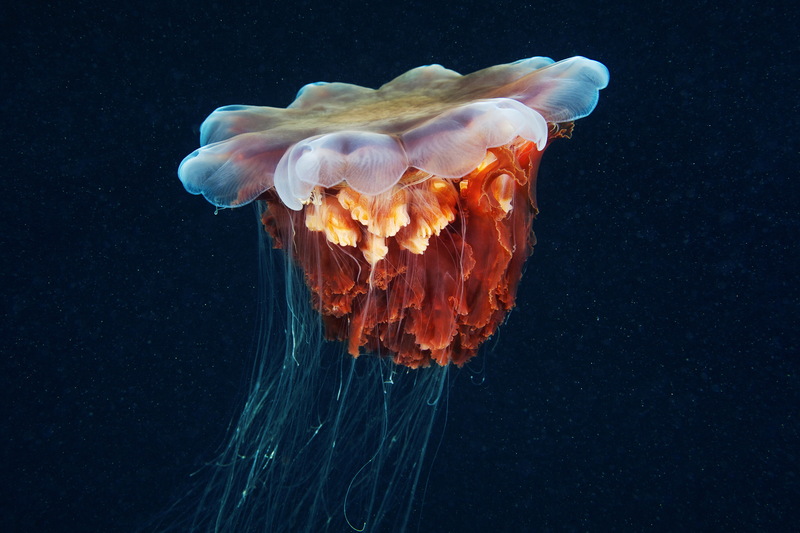 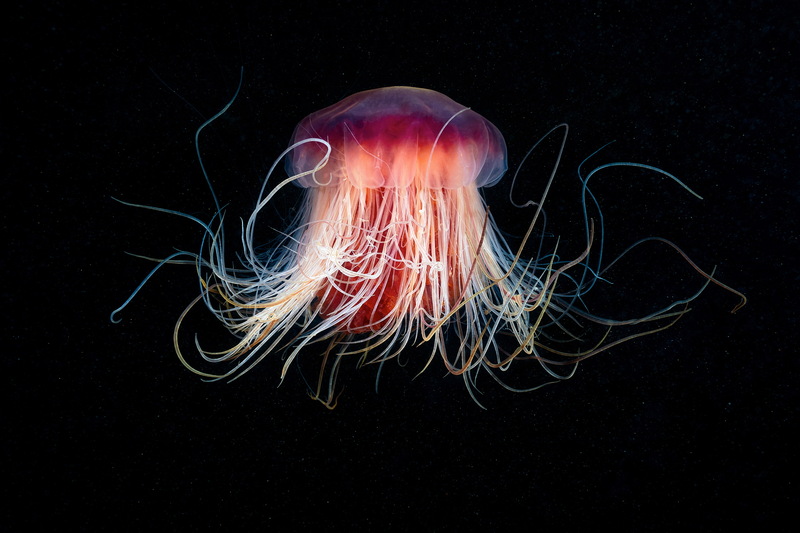 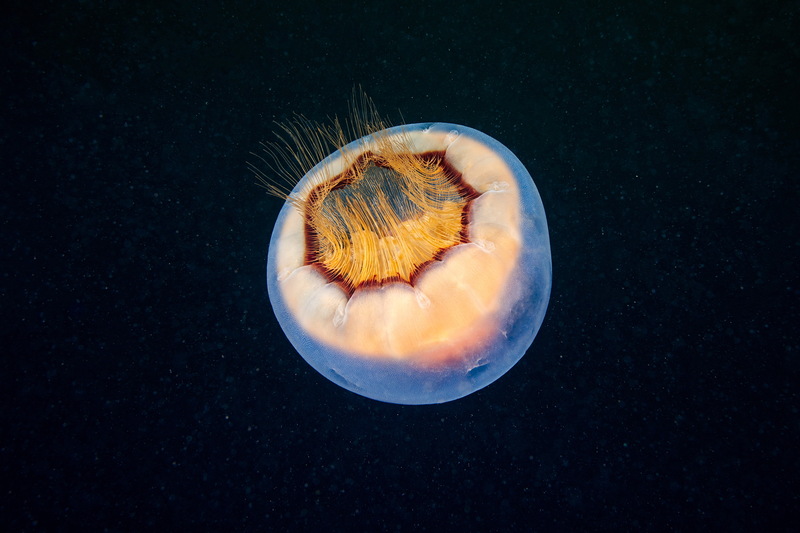 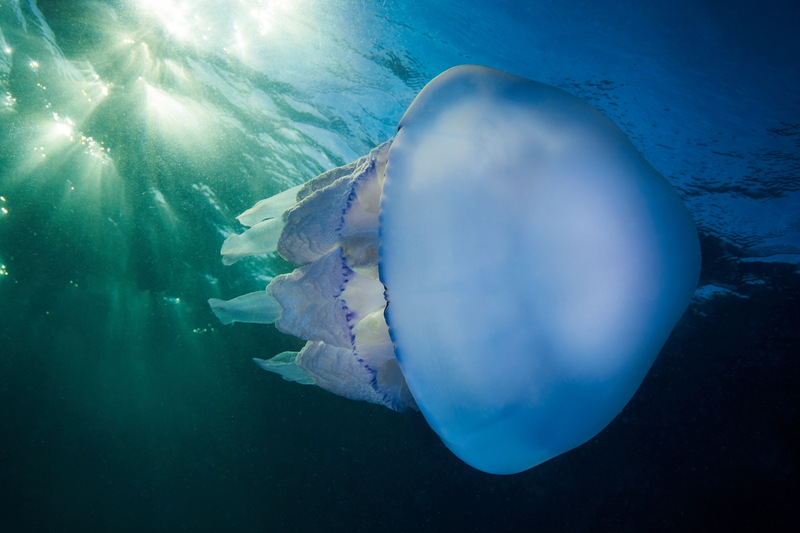 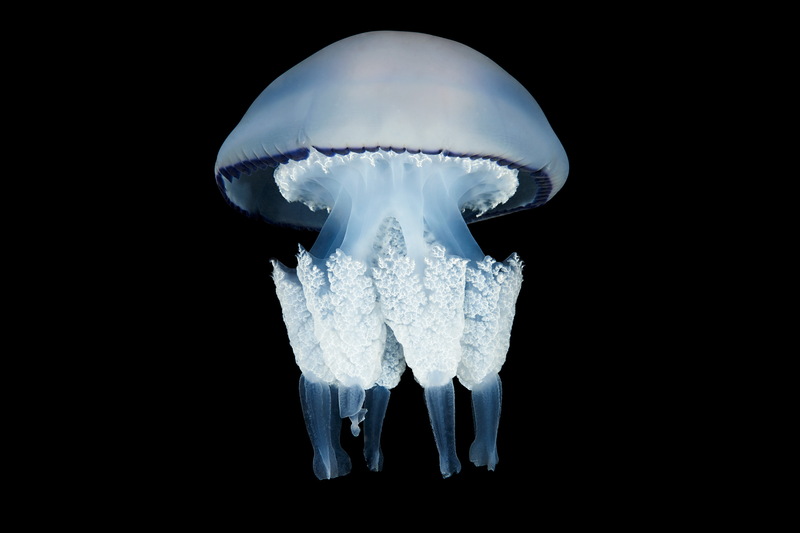 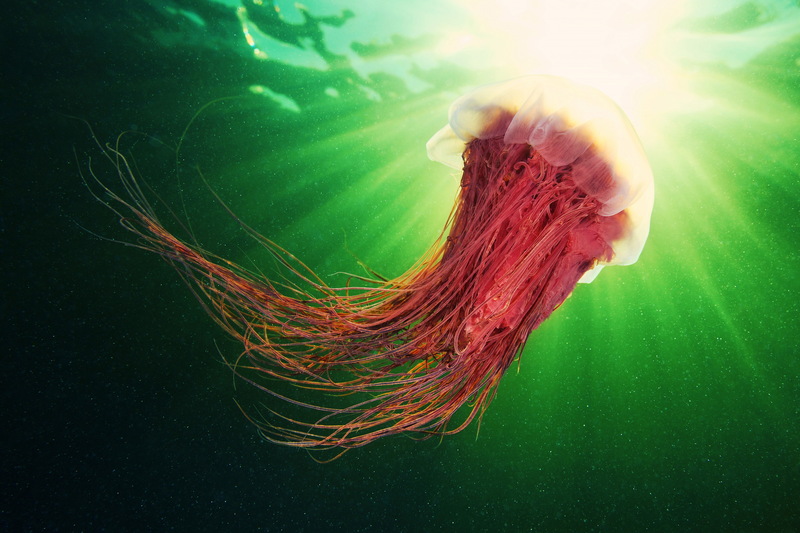 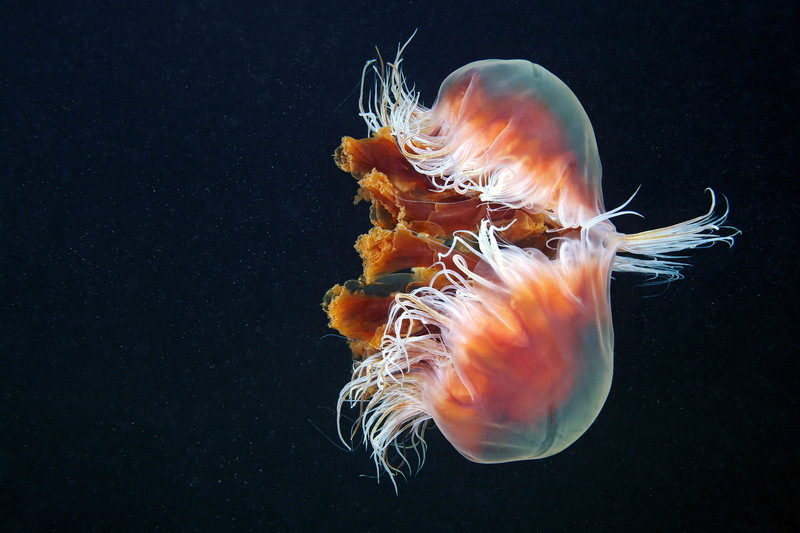 The mouth is the only opening in this jelly’s body, so it is used to both feed and remove waste from the body. 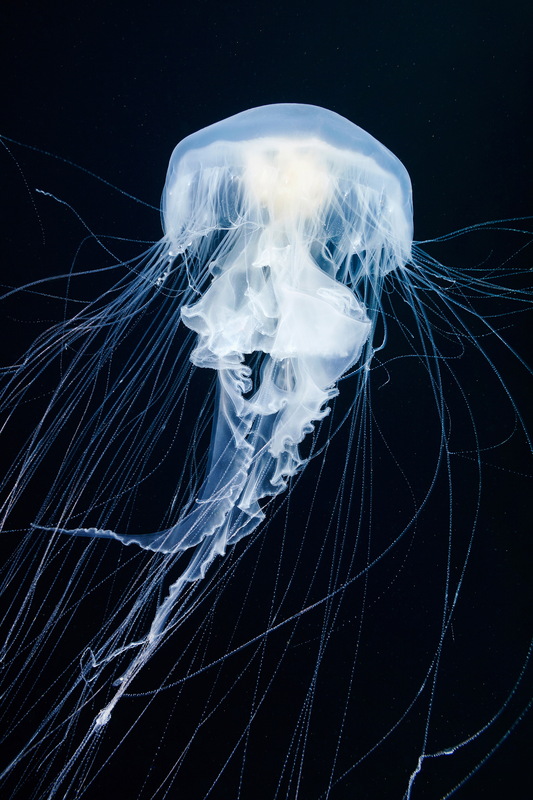 Some jellyfish even disperse mature reproductive cells through their mouths. 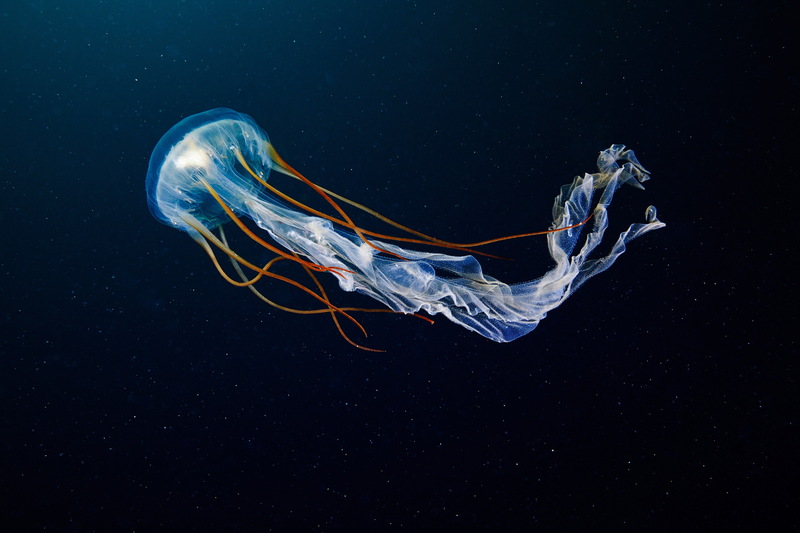 Radial channels spread from the stomach along the inner surface of the hood to carry nutrients out to the muscles, tentacles and sensory organs. 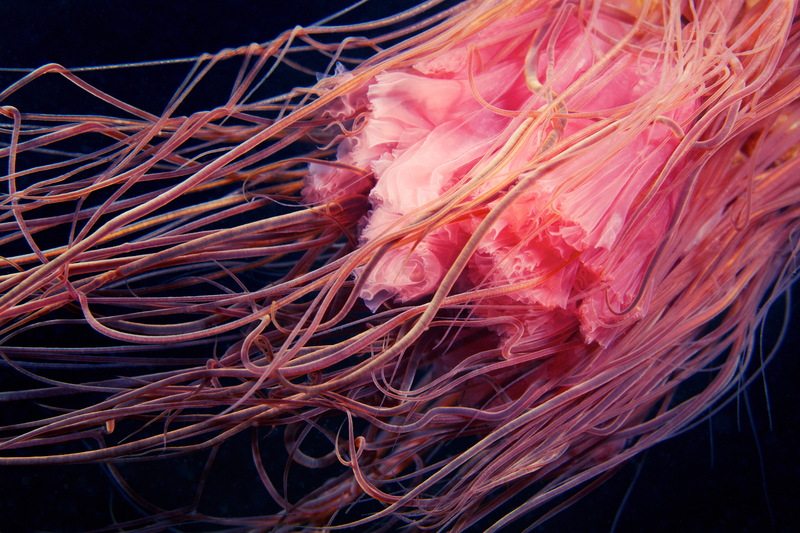 In special pits along the edge of the hood, scyphomedusae bear organs called rhopalia. 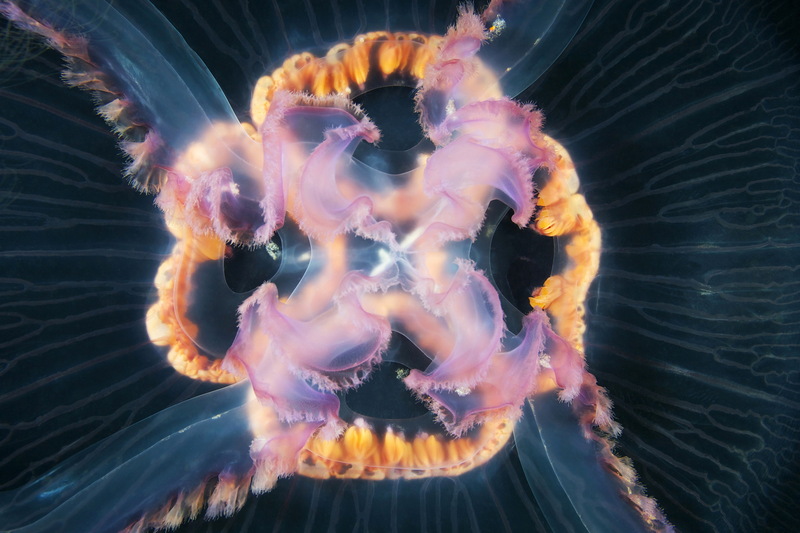 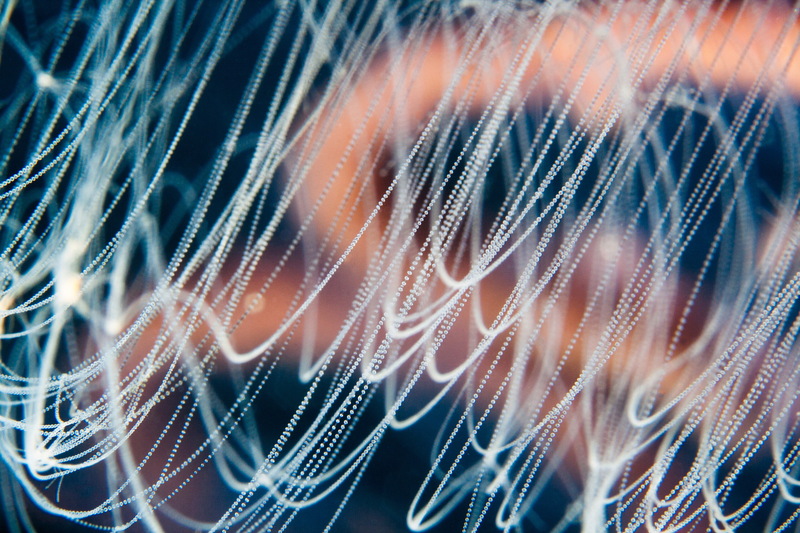 These are dense masses of deformed tentacles, which contain the creature’s balance sensors and tiny light-sensitive eyes. 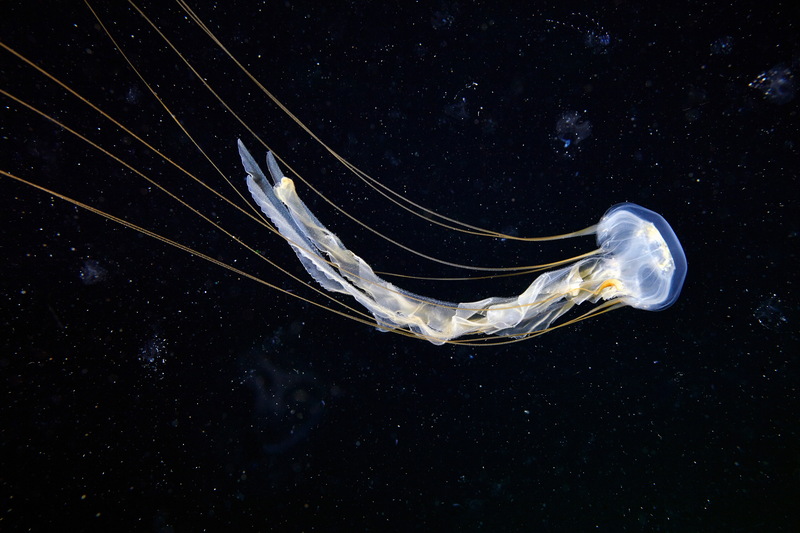 Scyphomedusae are beautiful and graceful creatures, but you always need to be careful. 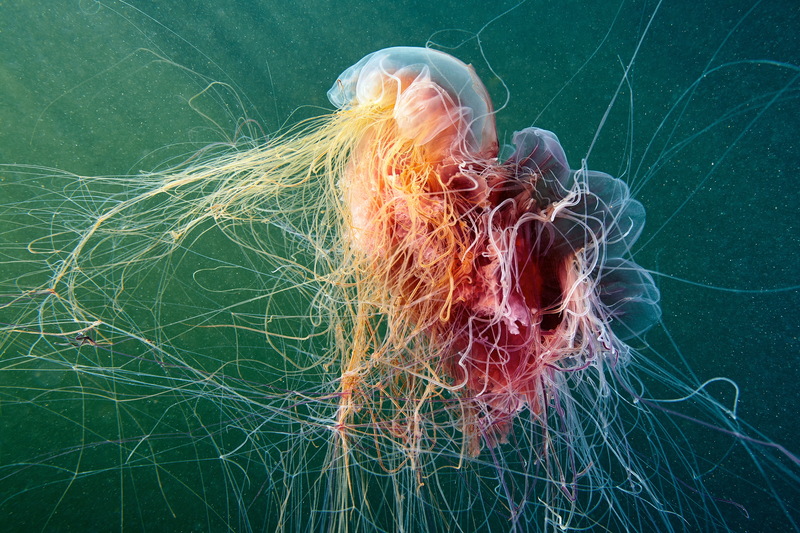 Almost all of them sting and leave painful burn marks on the skin. 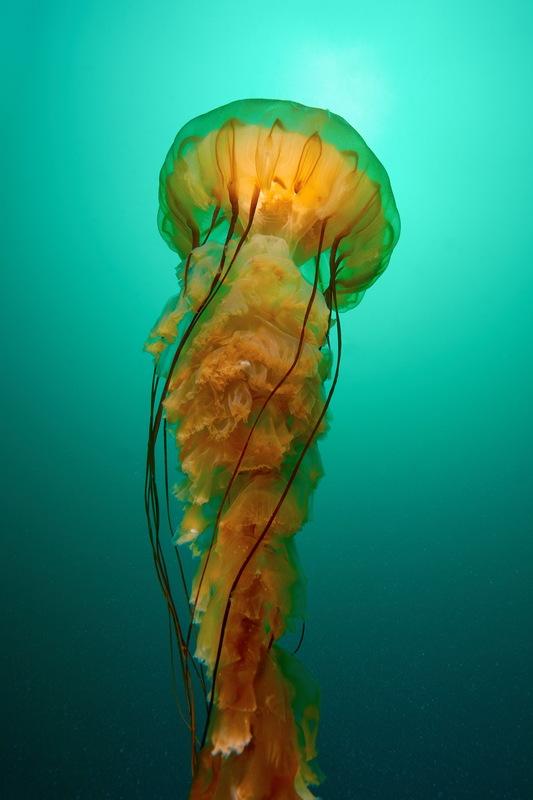 This is their method of both attack and self-defence. 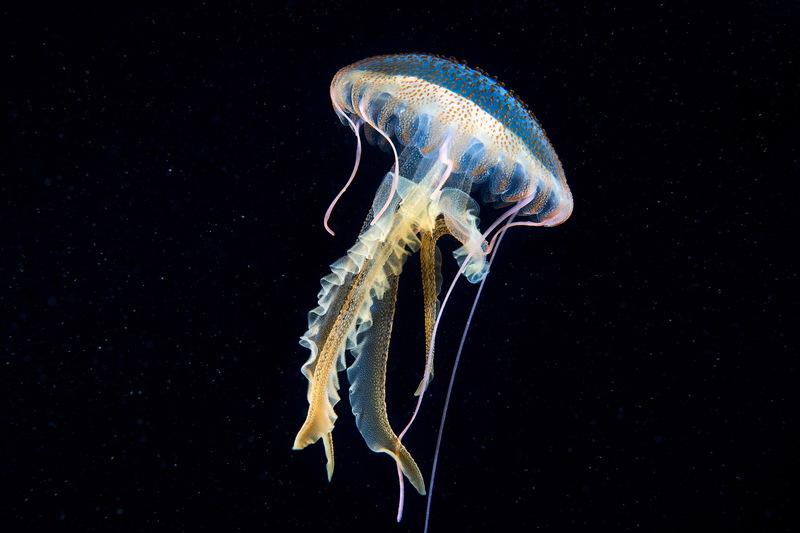 Their weapon of choice is a huge number of tiny stinging cells called cnidocytes. 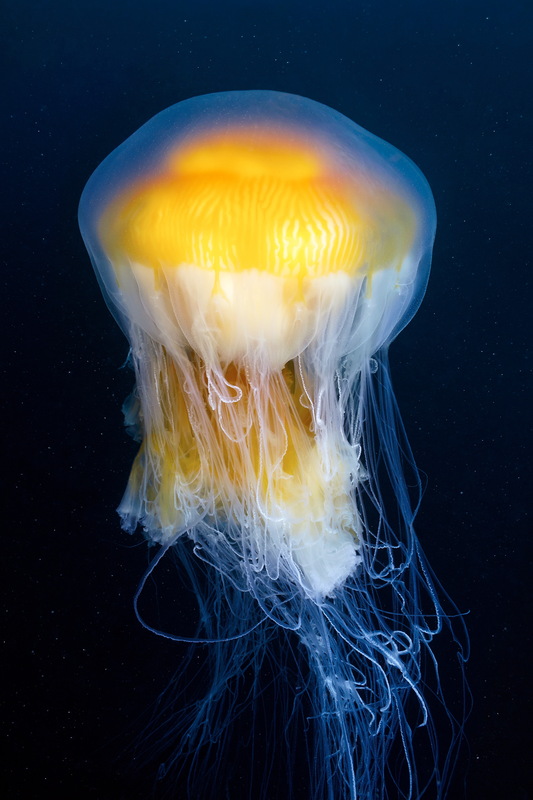 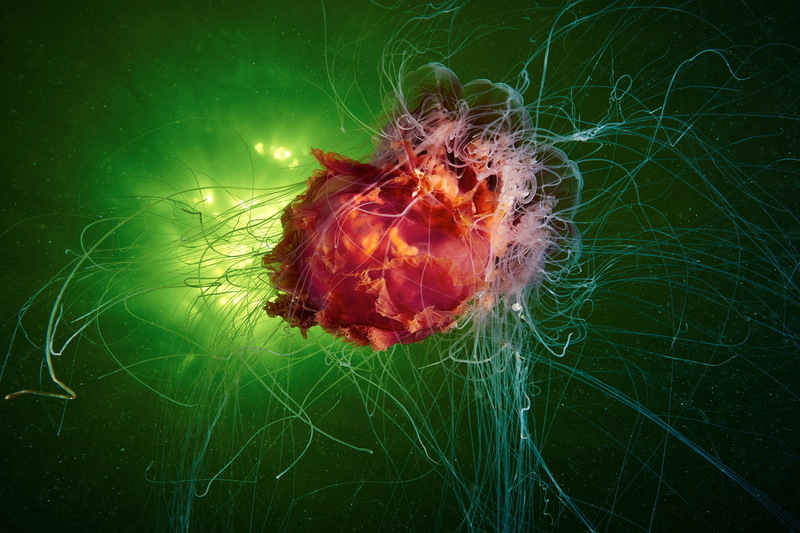 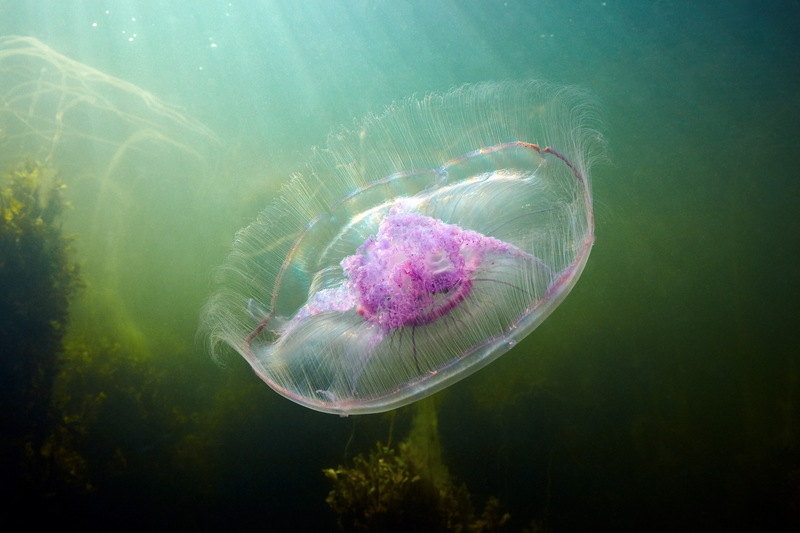 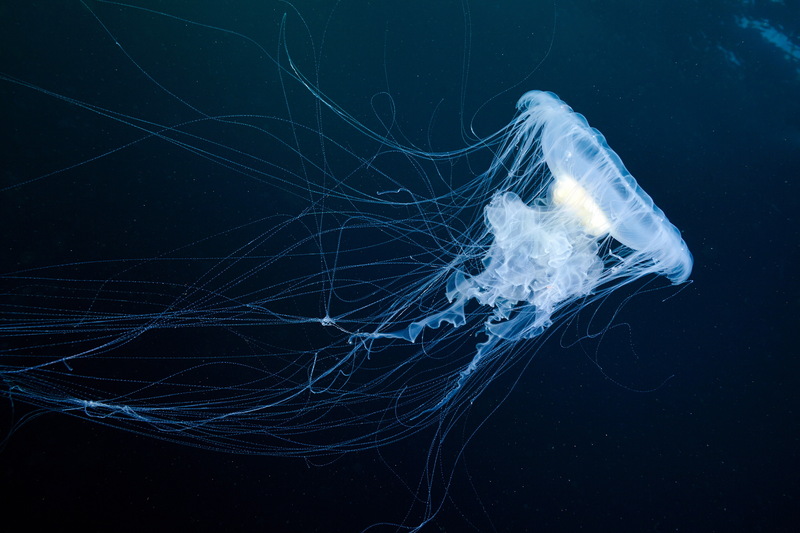 They cover the tentacles, oral lobes and sometimes even the hood of the jellyfish. 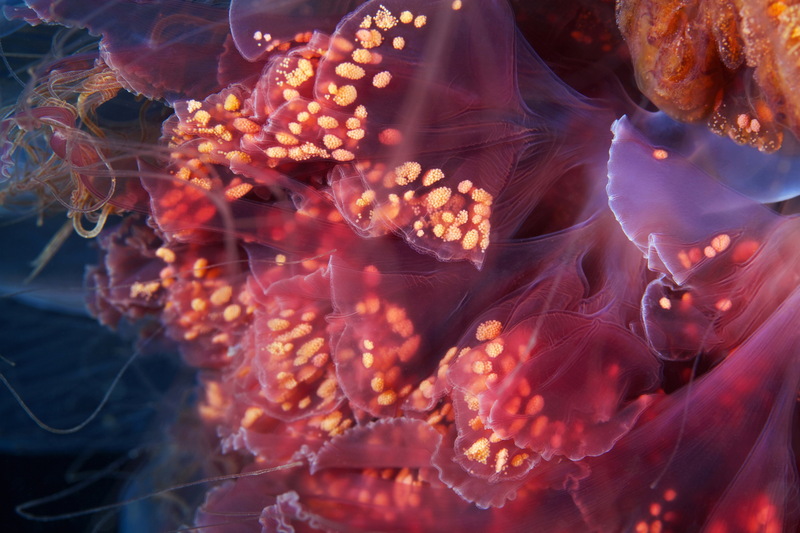 Each of these cells is a complex mechanism. 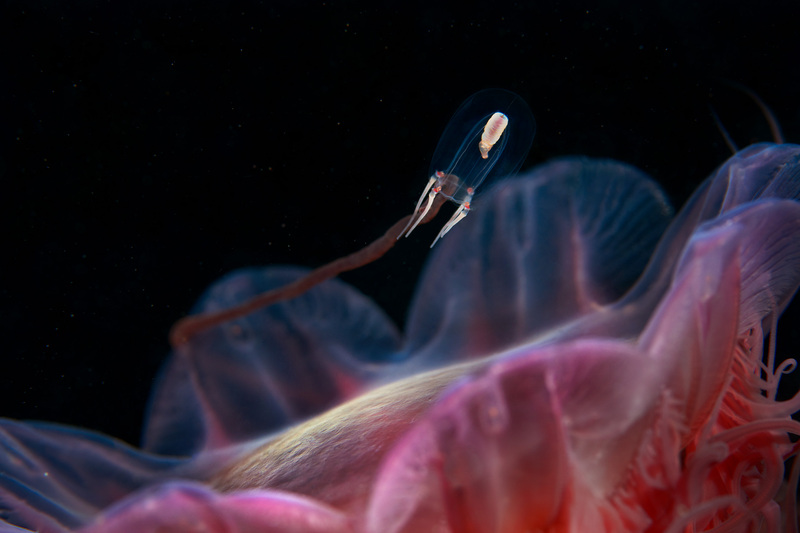 It consists of a capsule bearing a toxin and hollow stinging thread coiled up inside this capsule. 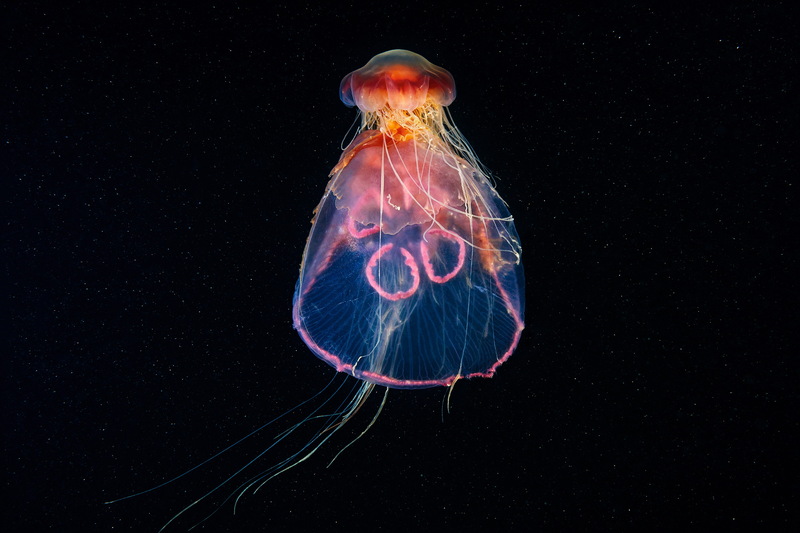 A little hair called a cnidocil sticks out of the cell to act as a kind of “trigger”. 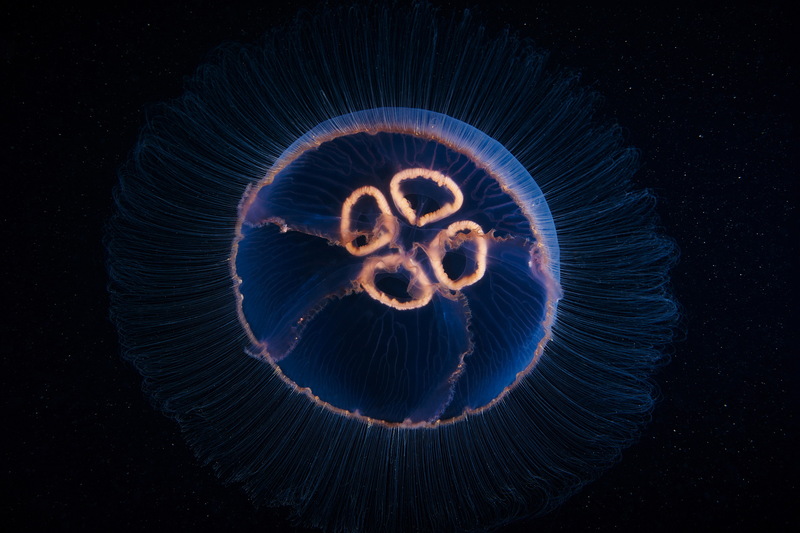 When a potential prey or an enemy touches this little hair, the whole system is activated mechanically: the cnidocyst “explodes” and the stinging thread is ejected instantly, piercing the victim’s body. 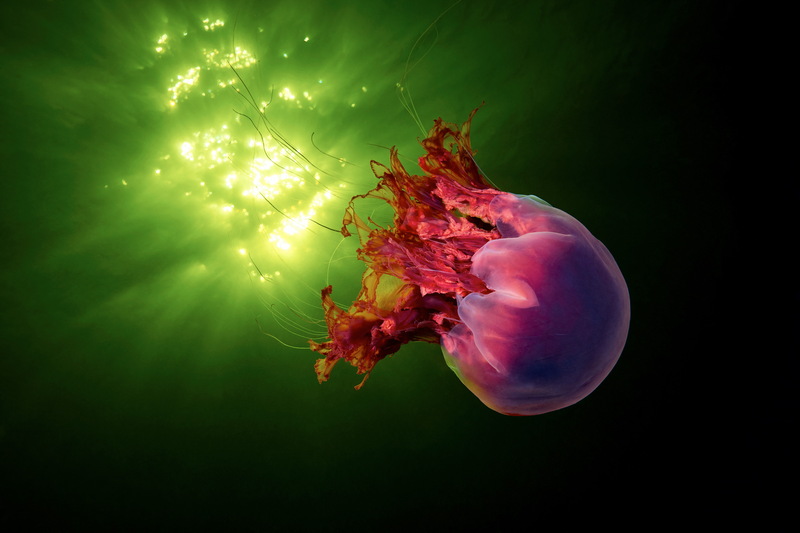 Immediately, the toxic contents of the cell are injected into the target’s body. 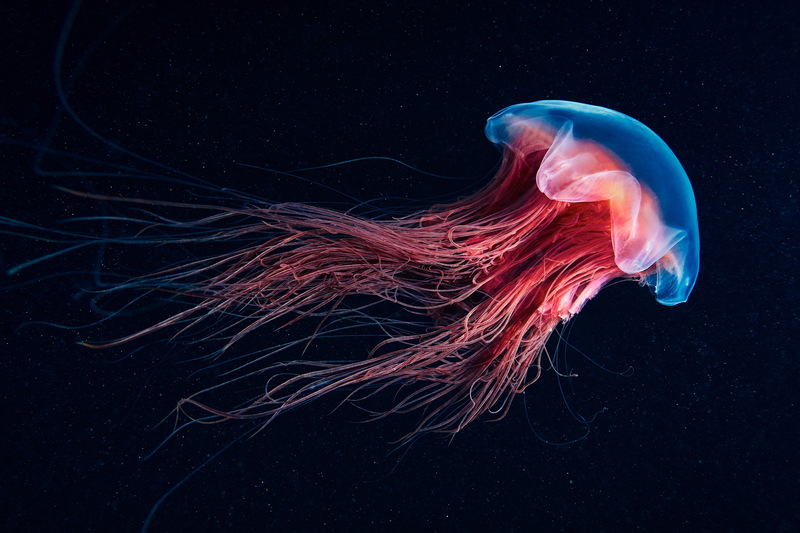 The neurotoxins act rapidly and paralyze the once mobile creature almost immediately, which allows these sluggish scyphomedusae to hunt large and powerful animals.